The aid industry is complex. Dozens of bilateral donors, hundreds of multilateral agencies, and thousands of non-governmental organisations litter the development landscape in all corners of the globe. In aid jargon, this is known as “fragmentation”. Conventional aid-effectiveness literature suggests that, whenever possible, donors should strive to prevent fragmentation – bigger aid projects, fewer donors who all work in partnership, and so on. In theory, this helps to reduce the burden on the partner country, prevent overlaps in funding, and streamline the whole development process. Papua New Guinea is a global standout when it comes to aid concentration from a particular partner. All of this makes sense. But can too much concentration be a bad thing? Could it stifle competition and contestability? Can it put too much pressure on one bilateral partner, and give them too much influence in the relationship? Are these trade-offs worth it for the efficiency gains of reduced fragmentation? These are important questions in the Pacific, particularly with our nearest neighbour Papua New Guinea. PNG is a global standout when it comes to aid concentration from a particular partner. When looking at all Pacific countries alongside the remaining 75 countries at the bottom of the Human Development Index (a measure of a country’s overall level of development – Australia ranks third), only 5 have donor concentrations above 50%. Of these 78 countries (3 Pacific countries sit outside of the bottom 75), the average concentration from the largest donor is 28.59%. PNG comes in fourth, with 70.66% of Organisation for Economic Cooperation and Development aid to PNG coming from Australia (when incorporating China, this number drops to 58%). Another striking point is that 6 of the top 10 countries with the highest donor concentrations are located in the Pacific. For many smaller countries, particularly those with Compact of Free Association relationships with the United States, this makes sense. Solomon Islands also seems reasonable considering Australia’s lead role in the Regional Assistance Mission to Solomon Islands initiative to restore law and order. To me, PNG stands out for a number of reasons. Its population, anywhere between 8-10 million, makes it comparable in size to some of the countries of Sub-Saharan Africa where hundreds of donors are active. Its development challenges, outlined in this Lowy Institute Report from last year, are also severe, with PNG ranking 153 out of 189 on the Human Development Index. The average donor concentration for countries below PNG on the index is 22.27%. PNG does get slightly less aid per capita than many others – the average on the index is $83 per person compared to PNG’s $64 – but it is by no means miserly, with Australia certainly paying its fair share. So why is aid to PNG so concentrated from Australia? I have a few ideas. The first is the strength of Australia’s shared history with PNG. As a former colony and closest neighbour, the Australian government always pushed to be the partner of choice to PNG. Australia has often encouraged partners to work through it, or to “leave PNG to us” at various points in time. This has changed in more recent years as Australia is now actively working to get more like-minded partners engaged in the region to counter China’s growing investments. Australia can often be its own worst enemy. 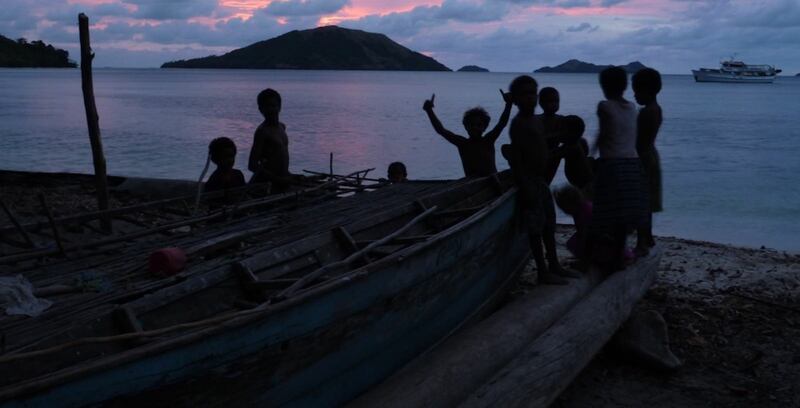 Another could be that PNG, despite its relative size to the rest of the Pacific, may simply still not be enticing enough, and too far away, for many donors to seriously engage. Australia is not faced with such tyranny of distance. It could also be that PNG does not invest enough in lobbying bilateral and multilateral agencies to invest more in the country. PNG’s diplomatic network is light, and only 13 OECD and G20 nations have resident embassies in PNG. It may also be that, frankly, delivering aid in PNG is hard. The PNG aid program is routinely one of Australia’s worst performers, which may not necessarily be the fault of PNG. Other donors have also been winding back their aid efforts in recent years. Médecins Sans Frontières packed up a nine-year operation focusing on family and sexual violence in the country in 2016. The Lowy Institute Pacific Aid Map also illustrates incredible volatility (exchange rates notwithstanding) in non-regional donor contributions to PNG. Donors that aren’t as strategically tied to PNG as Australia may simply see more bang for their buck elsewhere. Whatever the reasoning, the extreme concentration of aid from Australia to PNG stands out. As China, not a donor looking to coordinate with other donors, has emerged as a viable alternative choice. Perhaps it’s time for other donors to get more involved with Australia’s nearest neighbour. Special thanks to Michael Nguyen for helping to compile the data.